TV's iconic Dynamic Duo has been captured, along with a legion of abominable archenemies in a POW-erful numbered limited-edition collection. Featuring ALL 120 original broadcast episodes, ever popular guest stars like Julie Newmar and Cesar Romero, The Adam West Scrapbook, complete episode guide � and exploding with over 3 hours of all new extras � you can bring home all the crime fighting action that won generations of fans! Batmania Born! - Building the World of Batman � Explore the art and design behind the fiction. 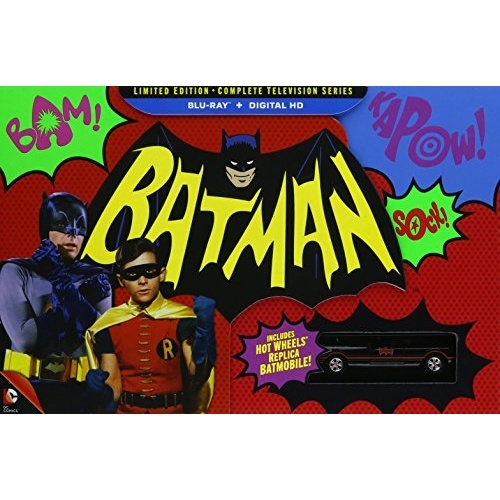 Bats of the Round Table � A candid conversation with Adam West and his celebrity friends, chatting all things Bat �66.